IBF bantamweight world champion Randy Caballero has brushed off ring-rust concerns ahead of his boxing return. He faces Bristol's Lee Haskins, who won the interim title earlier in the year, at the Mandalay Bay Hotel in Las Vegas on Saturday. Caballero is unbeaten in 22 fights, but the American has been out of the ring for more than a year through injury. "I've been gone for a year but I'm back, I'm hungry and I'm going to defend my title," said Caballero. He beat Stuart Hall last year to claim the vacant IBF belt, while Haskins, 32, took his record to 32 victories and three defeats with his win over Japan's Ryosuke Iwasa. "He is a tough guy and there is a reason why he is mandatory challenger," Caballero said. "He is coming a long way to win my title but I've trained way too hard, I'm ready and I'm going to make sure that belt stays wrapped around my waist." The fight was added to the undercard of the WBC middleweight title contest between Miguel Cotto and Saul Alvarez last month. 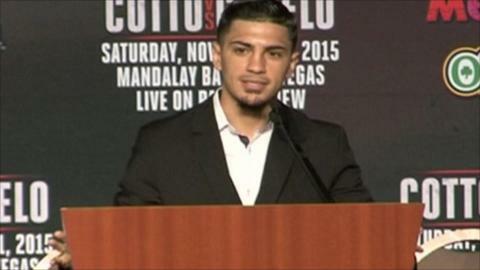 "I promise it is going to be a brand new Randy Caballero on Saturday and I'm going to show you why I'm world champion." Haskins, though, has vowed to return to Bristol a world champion and said: "Every boxer who gets into the sport wants to fight in Vegas. A few years ago I never thought I would have a chance like this. "I'm in great shape and we are looking to put on a great fight."